How To Train A Horse Without Force Part 1 is a progressive and comprehensive e-book which presents a detailed philosophy of holistic horse training and describes precisely how to put it into practice. Learning how to train a horse successfully is both demanding and highly fulfilling. Different ideas and techniques come and go, but does the wheel really need to be reinvented? Maybe real knowledge and horse wisdom has existed wherever compassionate people have shared their lives with horses. Modern horse owners have the advantage of being less constrained to unhelpful traditions, but also have less time to work every day with horses and learn first hand. 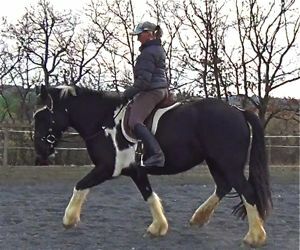 It is certainly educational and interesting reading those books which describe the perfect scenario between horse and rider, but how does that translate into your personal experience in attempting to train your horse if you are a nervous rider for example, or your horse doesn't fit easily into the 'talented' mould? I know that I spent many hours as a teenager, poring over book after book, enthusiastic to do what was right with my horses and become the best rider I could be. Looking back on that time, I can see that the gap between the ideas presented in the book and actually putting it into practice was mostly too wide for me to bridge, simply because the actual process was only hinted at. 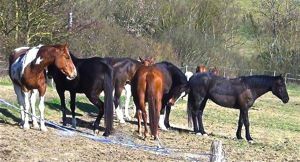 How to Train a Horse Without Force Part 1 does not assume knowledge, it describes the subject from as many different angles as possible to try to reach everyone who is interested in working sympathetically and safely with their horse. 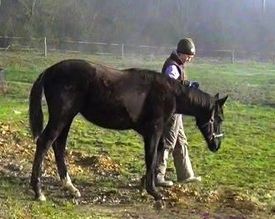 How to Train a Horse Without Force Part 1 is not a system made up of rigid rules. 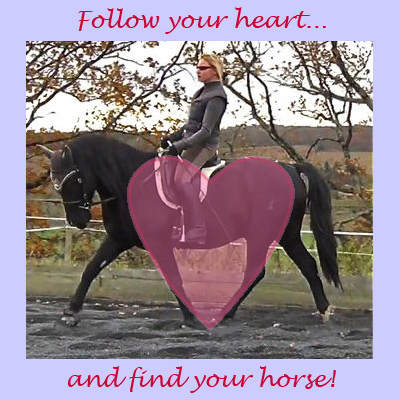 Instead it gives you an approach which offers the tools to make your own path into horse training - we all have our own unique skills to offer after all. This is a holistic, multidimensional approach, which is explained comprehensively in its philosophical context, as well as being described in precise practical detail. How to Train a Horse Without Force Part 1 is illustrated with relevant photographs and further explained through many real-life anecdotes and stories from my own experiences and those of others I have worked with. Who Is How To Train A Horse Without Force For? How many of us have been told they would need to buy a better horse to succeed? Or heard this said to another rider during a training clinic or a competition? That may be fair enough if your only ambition is to succeed in the competition ring, although time and effort put into rider skill might be better spent. However some of us - and I believe many of us - love the horse we have for his or her own sake. They might not be super-talented or problem free, but they are our unique friend and we care about what we can achieve with them. 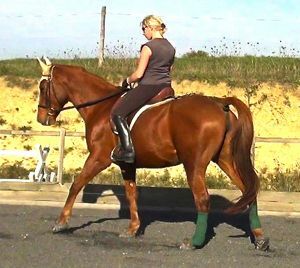 Many of us also know that a horse can be as talented as you like, but without a good trainer and rider, their full potential will never be realised. 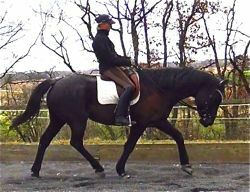 How to Train a Horse Without Force Part 1 has not been written for elite horses or riders, it is for anyone with any horse. That is not to say that it is not aiming high. I believe that there is no greater accomplishment than to create a strong enough bond with a horse so they will trust you enough to give you their physical power. This accomplishment is certainly not restricted to perfect equine or human specimens, or the fashionable horse breeds of the time. This training approach is not about quick-fixes and superficial solutions. 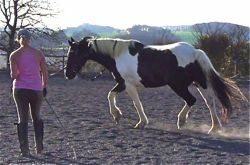 It offers an opportunity to explore the reality of your training relationship with your horse, right from the basics of handling through to the gymnastic preparation for ridden work. 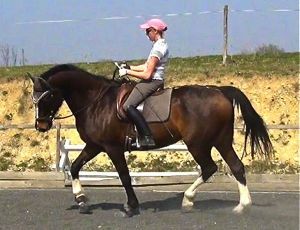 How to Train a Horse Without Force Part 1 does not claim that you can train a horse in five minutes, or even five months. Training a horse to gymnastic perfection takes a lifetime. Training yourself is also a never-ending process. That is the fun and the beauty of it. Ideally we commit to a horse for as long as they live, and we never stop learning from each other. Why is it necessary to climb onto our horse in half an hour when we could be riding them for twenty years? How To Train A Horse Without Force describes how to train a horse from his first encounter with people, through to being ready to be ridden in both his body and his mind. 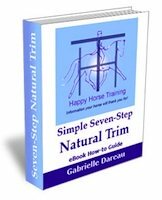 It covers in detail how to introduce all of the first handling skills such as leading and tying up, and continues to explain the crucial gymnastic preparation of a young horse before the rider gets on. Incorporating over 150 colour photographs and over sixty thousand words, the book is both a good read and highly instructive. 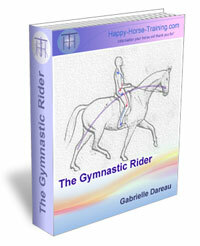 There is much background information about horse management, healing and trauma therapy included. 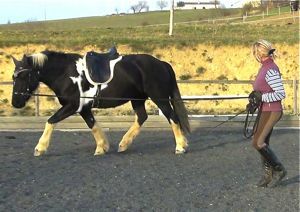 Correct gymnastic preparation on the lunge with a young horse (left) leads to successful backing and ridden work (below) because the basis of engagement on the 'ring' has already been established. 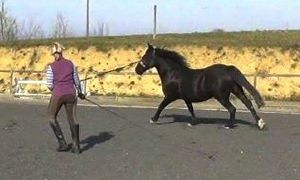 How To Train A HorseWithout Force will show you how to go about this. Most books on this subject describe how to train a horse from either the traditional horsemanship viewpoint of or a natural horsemanship outlook. This eBook is a rare combination, taking a genuinely holistic stance. It explores the value of keeping horses in as natural and stress-free an environment as possible, as well as providing a profound explanation of the correct biomechanical preparation of a horse for the rider. 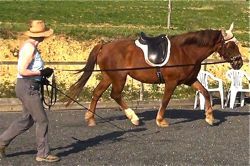 Part 2 of How To Train A Horse Without Force will go on to address the training of the horse under saddle. I believe that the right way for everyone is to follow their own intuition wherever it leads. This book shares the results of the journey I have made along with my sister and our twenty or so horses over a period of twenty five years. We have devoted our time and attention not only to good training, but to the entire question of domesticating horses and asking them to work with us. We have come to believe that with the right intention, fundamental truths do exist. The 'right' intention as we see it, is to put our love for each individual horse first, in every situation we encounter. 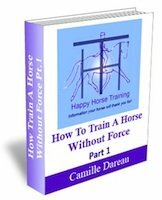 When you buy How To Train A Horse Without Force you will receive a free download of Camille Dareau's unique study of Equine Trauma. This cutting-edge understanding of equine trauma explores its causes, how to recognize it and ways of handling and healing it. Although you might never have even considered the existance of horse trauma, this supplement, with over 11 000 words, is likely to change profoundly your understanding of how horses are affected by the everyday demands we make of them. It is an ideal accompaniment to this ebook on horse training because it addresses many of the circumstances that cause our relations with horses to go wrong and prevent successful training. To look at the contents page of this e-book before purchasing, and see the full list of subjects covered in it, click here to download it as a pdf. To purchase securely How To Train A Horse Without Force Pt.1 for €19.99 click on 'Add to cart' below. Once you have confirmed your order you will receive an e-mail containing both the link to download the e-book and an additional link to receive your free bonus supplement. We are fully confident in the value of our publications, and the benefits that you will gain from this e-Book, but if you are not satisfied with your purchase we offer a full refund.